Whilst procrastinating over putting ideas on paper for the SubSea Resources website I started playing around with AudioScrobbler – could be evil, but somehow compelling. You can see what music I have been listening to recently at my AudioScrobbler page. Very nice. I will probably add this info to my site, seeings they expose it as RSS. A slew of updates on No2ID including a new film about the Nazi’s use of technology in implementing the holocaust. Wandering past Naked Timber I noticed that Bob had acquired some new wooden trunks. One of them had some writing on it. 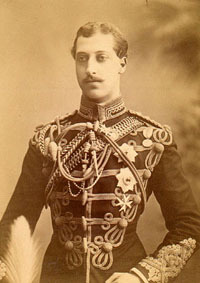 A closer look revealed that the trunk had at some stage belonged to HRH Prince Albert Victor of the 10th Huzzars. This rang a bell – Albert Victor, better known as Prince Eddie, is one of the people suspected of being Jack the Ripper!